The Boston Marathon -- When I started running, training and racing more seriously, I thought that qualifying for the Boston Marathon was out of my reach -- I didn't think it was possible. I had heard of the many attempts that some runners make just to try and qualify and had visions of only the super speedy being fast enough. As my training progressed, and my speed improved, qualifying for Boston seemed like it was within my grasp. However, I held off running a marathon, until I felt certain that my fitness was at a point that, with the proper training I could make the cut. I finally made the plunge in October 2010, running the Victoria marathon, and qualifying for Boston. The training leading up to the Boston Marathon was tough. I found it hard to slog out long runs in the cold, wet, wintery conditions. I had much preferred training for a fall marathon, over the summer! My training also took an interesting turn - because I was racing almost every second weekend between January and March, I had to fit in my long runs after my races. I would race between 5-12 kms and then run an extra 15-30 afterwards to make up the long run. This actually made it somewhat more enjoyable, as I was running in various different locations around the Island, and had the company of Shane for at least parts of most of those runs, as he was also training for Boston. We left for Boston on the Friday before the race, giving us a few days to adjust to the 3-hour time difference and see a few of the sights around the city. Boston was spectacular - I loved it! As we walked along the residential streets, I felt like I had just walked into the Cosby show - with the brick townhouses side-by-side, with the steps leading up to the entrance, the flower pots by the windows, and a few street-level enclosed patios. I loved the way it looked, especially since it was so different than Victoria. We actually missed the turn-off to our hostel because we were too busy looking at the architecture. The next day we checked-in at the race expo and took in a good part of the city 'walking tour'. Around Boston, there is a red-brick path that you can follow to bring you past most of the historical buildings and places in the city. It's really well-laid out and easy to follow. The highlight of the day were touring the USS Constitution, the oldest navy ship in the US, with a colourful and interesting history. We got to see the depths of the boat, where the eating, sleeping and working took place. This is also where battles were fought and won, as cannonballs actually bounced off the ship's wooden hull, giving it the name 'Ironsides'. It was fascinating seeing the quarters in which the sailors lived, ate and slept - the rows of hanging hammocks that were beds - and hearing about their long 16 hours days that were truncated with eating and sleeping in 4 hour shifts. In the same shipyard, we also saw a WWII warship, of a totally different design and nature - with small enclosed spaces. The Charlestown District of Boston was also very picturesque - again with very attractive townhomes and winding, narrow streets. We also made our way up to the Bunker Hill Monument and climbed the 294 steps to the top of the tower. It was beautiful to see across the Boston landscape and interesting to see how many of the homes had rooftop patios, with barbecues and stylish patio furniture. That evening we fit in an easy run along the river, and I was surprised at how drained I felt. My knee was also twinging a bit, and I just hoped that the pain would not appear on Monday during the marathon. That evening for dinner we headed to the Chinatown district to try out a vegan Thai restaurant. I had fantastic memories of the vegan Thai restaurants that I ate at in Bangkok, and was hoping for a similar experience. It wasn't quite the same as Thailand, but the dishes were still pretty tasty, and it was fun to have a huge menu to choose from, rather than just a few select items. If I lived in Boston, I would totally return to try out more of their offerings. The next day was expo round 2. The expo was absolutely humongous - definitely the largest I'd ever seen. I'm actually glad that we did it in two days, because after a few hours there it got a bit overwhelming. There were people everywhere, and both days were just as busy. There were lots of samples to try and lots of shoes to try on - I think I actually got a bit overloaded with sugar, with all of the shot blocks, gels, clif bars and shots, frozen yogurt, gatorade drinks etc. But it was fun to see such a huge event, and I managed to pick up a few pairs of shoes in the $50 discount section. That evening we checked out the carbo-loading dinner with Chris Callendar and his wife Wendy, and even managed to share a table with runners from Vancouver! The great drama of the event was the heat. Saturday and Sunday had been fairly warm, and the predictions were that Monday was going to be even hotter, with temperatures reaching into the 30s -- and for running on pavement, that's damn hot. As such, the race organizers sent out emails and warned racers of the dangers of running in high heat, and encouraged people not to race if they were not very fit and well trained. They even offered deferrals to the next year, for anyone who chose not to race this year - about 4,000 people took the offer. Shane and I didn't even contemplate it -- we had come this far, trained hard, and were all in. I figured it might affect my time, and lowered my expectations, knowing that the heat would likely cause me to slow down somewhat. The big day! Despite the actual race not starting until 10:00am or 10:20am for me, as I was in the second wave, we were up by around 6am, to grab some breakfast and make our way to the buses that would transport us to the start-line. It was an early start, and we'd been warned by many people to take extra clothes, as the morning can be cold, and you usually end up waiting around for an hour or more until it's time to make it to the start line. I didn't think we'd have to worry about the cold this year, but did take some of the extra clothes that I'd brought along, with the intention of leaving them for charity at the race start. Despite our early start, once we got to the park where the buses were lined up, we had a 45 minute wait until we actually made it onto a bus. The line-ups were a bit chaotic, and it was not clear which line was going where, or that they were in fact going in an orderly fashion. To make matters worse, we had to go hunt down the port-a-potties, as they had been dropped off in the wrong location on the other side of the park. We started getting a bit panicky, as we knew it was about an hour long drive to the start, and Shane was supposed to be leaving for his corral shortly after 9am. Luckily, we were the last to hop onto a bus that left at 7:45, which should give us just enough time to get to the starting line. With so many racers, it's definitely a big production just to get everyone to the start. At the start, Shane had just enough time to drop off his bag and make a potty-stop before heading off to his corral. I was just 20 minutes behind him, and so just had a bit of time to seek some shade to sit in before heading over myself. The temperature was already sweltering, and I was seeking as much shade as I could find, and has already started pouring water over my head and hat to try and start off as cool as possible. The start line was about a 10 minute walk away from the Athlete's village, where the bus had dropped us off, and on the way to the start the evidence of the energy and support of the residents was already apparent - as we walked past a station that someone had set up on their front lawn offering a variety of goodies to racers: pins, hair elastics, vaseline etc. It was soo great to see! I arrived at the start, just as the first wave took off. I made one final potty-stop - and this was the place to stop, as there were no line-ups, as everyone had been lining up at the Athlete's village instead. I nearly began to sweat as I made my way to my corral, and stuck in the shade until the last moments before my wave took off. I positioned myself near the front of corral '2', and waited out the few last moments before the gun went off - in nervous anticipation. Soon enough we were off, and the road descended as we made our way through the first mile through the streets of Hopkington. The Boston Marathon is actually a net-loss elevation course, and the majority of the first half is actually slightly downhill. This can lead to fast times, but more often to thrashed quads that have taken a pounding in the early miles, making it hard to cover the final 10-15 kilometers, which includes the famed Heartbreak Hill. I found the entire race, but particularly the first 5-10 kilometers quite packed. The pace started out slower than I'd expected, and although I would have liked to have ran faster, I was hampered by the crowds. This actually probably ended up being a good thing, as I was stopped from starting out too fast on the course. My original goal was to finish in 3:15 or faster, but with the heat I'd readjusted my goal, and I'd be happy with just posting a PB, which would be anything faster than 3:22:45 - although I secretly hoped I could still break 3:20. As we ran through those first kilometers, I tried not to focus too much on my time, and just enjoy the experience and focus on not overheating. I aimed to run in the shade as much as possible, and picked up water and orange slices along the way from both the official aid stations and residents cheering along the side-lines. The crowds were absolutely phenomenal. I'd never experienced anything like it. They lined practically the entire course, and were graciously handing out oranges slices, water and ice to the thousands of runners - and cheering loudly along the way and of course doling out lots of hand slaps. It was great, and actually what got me through the race. Without the generosity of the crowds, I don't think I would have fared quite as well. A few people brought out their hoses to spray the runners, and a few kids lined the streets with buckets full of water asking if anyone wanted a 'splash'. I graciously raised my hands to indulge in a couple of those - which the kids were eager to comply with. The race organizers also put together a few spray stations along the route and the fire department came to open up a few fire hydrants, but it was truly the ice that saved the day for me. On numerous occasions, I grabbed handfuls of ice that I stuffed down my bra or under my hat, and it was lovely to help cool down the core and my head. The race took us through residential neighbourhoods, where we were running in front of people's homes, and through a few strips of commercial districts through some small towns. Almost every step of the way there were crowds cheering us on. Many people had written their name on their body or their shirt, and if the crowds could see your name they'd call it out, otherwise they'd take any bit of info they could gleam to cheer you along - so there were many individuals with Canadian flags or other markings, and I heard many 'go Canada' along the route. But, the highlight was definitely running past the all-girl's college. They lined the roadside and held signs saying 'Kiss me I'm...... French, a math major, from Mexico, speak Spanish ...' They were definitely the most enthusiastic bunch along the entire route too. So awesome. They would get super excited if someone actually went over to get a kiss too! Despite the heat, my energy and legs felt pretty good throughout. I kept checking in as to how I was feeling, and if I had started to feel really bad, I definitely would have taken it back a notch. However, while I was hot, I also wanted to get out of the heat and I knew that if I slowed down, I would actually end up being under the sun for even longer. I split half-way at 1:38:48, which if I was able to keep up the pace would keep me within my revised goal. Despite the kilometers of downhill, my legs were still feeling pretty good at this point, and I hoped that I would be able to hold on. Most of the course runs together in a blur - with a lot of my energy spent on seeking the shadiest side of the road, the water stops or random offerings by onlookers and trying to stay as cool as possible. Then came the hilly part of the course, which starts around 27 km and climaxes with Heartbreak Hill around 32 km. I had been warned about how hard this section of the course can feel, even though the hills were relatively not that high. Heartbreak Hill only rises about 75 feet. However, luckily the energy and legs stayed with me throughout this section, and I didn't find the hills too challenging. I kept on wondering which one was the famed Heartbreak Hill, and was surprised when I'd surmounted it -- was that all, I thought? I guess I had gotten used to doing much steeper and harder hills just running around Victoria and in the trails. From here on out, the course is pretty much downhill to the end. But, despite the 'easy' finish, it was anything but easy. Just as in any marathon, the legs get tired, the body gets tired and you just want to be done. Towards the end the racecourse got even more congested. I had been passing people the entire way, but near the end the number of people walking increased tenfold, and I kept on having to weave here and there to pass them, as no one was moving to the side, but just started walking anywhere they chose. The water stops also got a LOT slower, as many racers were walking through them, making it hard to quickly just grab a cup of water or gatorade. This weaving and stopping to get water cost me at least a couple of minutes. But, finally the end neared, and the crowds became even larger and louder. The last few miles of the course were insane -- I couldn't believe how loud the cheering was. The last 2 miles also seemed to last forever. I knew the finish was close, but it was still just a few more steps away, and I couldn't slow down now. So, I kept pushing, through the crowded streets, underneath the underpass and up the final little hill that at any other point in the course would have gone unnoticed - and then to the final corner. Once I rounded that corner, I still had a good 700 meters or so to the finish line. I couldn't quite read the clock, but tried to pick up my pace as much as I could. As I got closer, I saw that I wouldn't make it under 3:20, but I could still make it within 3:20 -- and so I did, crossing the line at 3:20:39 - losing only 2 minutes on the last half -- which I was pretty proud about, given the heat. After crossing the finish line, is when the real torture set in. The road was in complete open sun without any shade in sight, and it felt like I had to walk so long before I was even offered any refreshment. Then, I was able to grab a water, and was handed a food bag, and made my way along the long walk (probably about another 700 meters) to find my bus and my drop bag. Next, I had to find Shane, which took me along another long route to our appointed meeting spot, but unnecessarily so, as I missed a turn that would have cut my walk by several minutes. Finally, I found Shane and shade, and a spot of grass to sit down on. It was great to have the race done, and I was quite pleased with how I was able to run, and was happy that I was able to get a 2 minute PB in these conditions. The recovery was definitely slow, as my inner quads took their sweet time healing -- man I've never been in such pain before just to sit down on the toilet! I also ended up getting a bit of heat exhaustion, as I found myself having to dunk my head in a cold shower several times that afternoon just to get cooled off. Overall, it was a fun trip, and I'm glad that I got to experience the marathon and see what Boston was all about. Shane and I had one more day in Boston after the marathon, and took in a few more of the sights along the walking tour, including Paul Revere's house. I'm glad to have done it, but will have to set my sights on another marathon one day to reach that 3:15 or faster goal! Happy St Patrick’s Day – let’s go run a 50 km ultramarathon! For the last few years, I’ve been contemplating doing a 50 km race, but had not committed myself to the endeavour. My motivation came as Shane decided that he was going to try the ultra scene in 2012, and start the year off with Chuckanut. Well, I thought I’ll be training for the Boston marathon during that time anyway, so it seemed like a good time to bite the bullet and sign up for my first ultra. 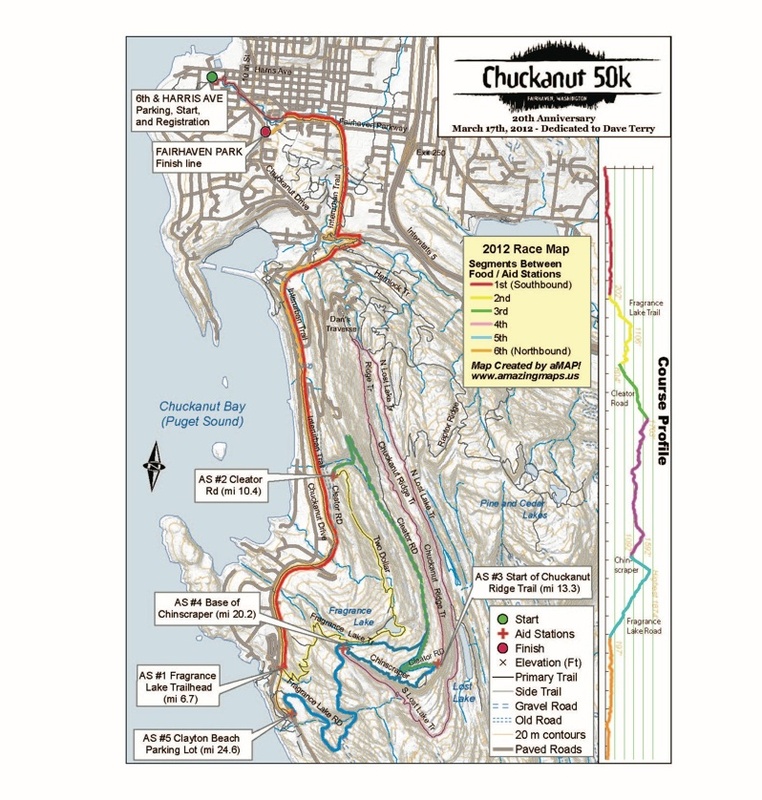 Chuckanut’s popularity has grown exponentially in the last few years, and in order to guarantee ourselves a spot on the start line, we woke up early on the morning that race registration opened, and were on our respective computers logging in to purchase a race entry. The first 500 spots sold out in 3 hours – much faster than in previous years. However, as it was the 20th anniversary year for the race, the race directors got approval to expand the entries for the race and opened it up for another 500 registrations. Eventually 700 signed up for the race – with a very deep and competitive field. It seemed like every fast ultra-runner out there wanted to run this race, and it stacked up with some impressive talent, including fellow Canadians Jason Loutitt and Adam Campbell. Back to race morning. We awoke early, as the race started at 8:00am, and we were staying about 50 minutes away at Shane’s uncle’s place. The weather was gray, rainy, cold and dismal. Not really inviting to go run 50 km. There was no indoor waiting area at the start, so we got ourselves ready in the car and hit the start line at the last minute. It was definitely a chaotic morning, with HUGE line-ups for the port-a-potties. However, once we were all corralled up and ready to go, it felt like it had warmed up already quite a bit, and thankfully the rain had eased off somewhat. The conditions on the race course were reported to be snowy, muddy, wet and slippery. This would definitely make for a slower race, and I only hoped that the snow on the top was not too deep. Finally, it was time for the countdown and we were off. For once, the pace started off reasonably, as everyone jostled to find their groove. I was a bit nervous about how this race would go, and was just hoping that I would have enough energy to make it through and not feel miserable. I’d come down with a cold earlier in the week, and although it had not been too bad, it had made a significant dent in my energy. The first 10 km of the race is relatively flat along a wide and not too interesting trail. There were a couple of small early climbs, and then a few downhill sections, that I envisioned would be tough on the way back when the legs would be fatigue – but first I had to get through this first 10 kilometers. Off the bat, my energy started to wane, and the sickness feeling took hold. ‘Drat’ I thought, hopefully I don’t feel this way for the entire race, otherwise, it would be a very long and uncomfortable run. That first 10 kilometers, although relatively flat, felt long and it was a battle between my mind and my body. Although, I knew this is how the race would end, I didn’t figure that this is how it would start. My mind wanted to go faster, knew I could go faster, but my body was holding back and was only willing to let me go at a more leisurely pace. So, I settled in, and figured this might end up as a just ‘survive it’ race. There were mile markers along this first section of the course, and I counted my way down to the first aid station and the end of the first section. Soon, I heard the cheers, as the field made a left turn up into the forest and mountains. This first section was indeed slow: 54:30 for 10.7 kilometers. Interestingly, as we ascended into the mountain, this is where I started to actually feel like myself again. Somehow, I’d been able to outrun my cold, and my legs and energy returned to a normal state. Who ever thought that an uphill would make me feel better… but I’ll take it. The first climb was steady, single-track like, although not grueling, during which we rose about 1,000 feet over around 6.5 kms. It took me 41:35 minutes. Okay, so I wasn’t blazing up the trails, but I was definitely holding my own and wasn’t getting passed - and this is where the race became fun for me. Getting into the forest was a definite mental boost. We climbed our way out of mud and into snow – as it covered everything around us. Luckily though, the trail itself was well tread, and as a result it was just mucky, but not snowy. I part jogged and part hiked up the hills – trying to jog it along the less steep sections, and hiked the steeper parts. Again, I was surrounded by men – and we formed a long train, as we rose our way higher and higher. Then, we got a bit of a descent – a short rest before heading into another climb. The descent was switch-back along a single-track trail that wasn’t too steep. I definitely enjoyed this part. Descent #1: 33:40. Climb #2 took us along a wide road over 4.5 kms. This climb was over 1,000 feet, and again I resorted to a partial jog and partial hike – although for the most part I was able to hold a jogging stride. This was a long climb and I kept thinking the top was just around the corner, as each little bend seemed like it was the high point, but alas it would not be so, as I was continually disappointed to only to see another rise up ahead. This section was a bit slippery, and my goal was to try and stay in the most secure spots on the road. I kept a pretty decent pace all the way up and managed to pass a few men, and one woman who had been ahead of me. Mid-way through this section, I dove into the ‘real food’ that I had brought. I started craving something a bit more solid and took out my bag of steamed potatoes, sweet potatoes (yams) and a hard-boiled egg. However, I unloaded a portion of the bag onto the ground, as I pulled it out of my pack. I only noticed when someone yelled ‘Did I just see an egg fall to the ground?” Oops, that was me – and yes, I was hungry enough to go back to pick it up, dust off the dirt and place it back in my bag for later. Finally, the top appeared with Aid station #3 – climb #2 – 33:43 total time. This is the only aid station where I actually stopped. We were going into a long ridge section that covered about 12 kilometers and I wanted to top up my water – I also grabbed a banana, which tasted absolutely amazing. The next section of the course was the most technical of the entire race. The trail was narrow and windy and there were logs, stumps and many other obstacles to go over and around. I was on my own for about 10-15 minutes, which I thoroughly enjoyed, but I figured it wouldn’t last long. My technical running skills were not up to part for this slippery, snowy, technical section, and as I slowed down, I knew there’d likely be some men coming up behind me that would be able to blow past with their confident running. Soon enough it felt like there was a train of men behind me, waiting to pass. I stepped aside to let some go by, and it felt like 10 people passed me! Ok- not cool – definitely have to work on those technical confidence skills! However despite my struggles, I thoroughly enjoyed this part of the course- it was an absolutely beautiful with the snow tipped trees. It felt like a little winter wonderland. Along the entire race-course there were little signs and pictures that had been posted with motivational language and tips reminding us to drink and keep fuelled. These were totally enjoyable, and as a first time runner, they put a smile on my face. These signs also identified that we were coming up to a portion of the course that was supposed to offer a spectacular view. Unfortunately, it was blocked by the clouds, and only the trees were visible – but the race organizers were kind enough to post a picture on one of these signs showing us what the view was supposed to look like ;-) – thanks guys. Although I’d reviewed the course map prior to race-day, I was still surprised at how long this section of the course took to run. It wound back and forth and took me a total of 1 hour 27 minutes. By the end, I was definitely happy to see the aid station – except that it now led into the much anticipated and brutal Chinscraper climb – a short (1.8 km), but extremely steep ascent. The only upside was that this was the final climb of the race. After this it really was all downhill and flat. The hiking started almost instantaneously. My legs were pretty fatigued by this point, and it was more of a survive-it hike rather than a ‘push-it’ hike. This was evidenced by the fact that I was passed by a good number of people, when I usually hold my own on the ascents. My legs were burning by the end and I was more than happy to make it to the top. Total time: an embarrassing 21:09. Now we got into an approximately 6 km descent that was a good quad crusher. Most of it was on a wide logging road that was easy to power down – and maybe too easy. I enjoyed letting my body fall into the hill and made up some ground on this descent, as I was able to pass a few people. Near the bottom, we transitioned onto a smaller trail that wound around a bit, and although the downhill was ‘easy-ish’, I was looking forward to getting off the quad pounder and onto something different. Despite the downhill grade, it still took me 29:48 to run this section. Wow – I definitely was feeling faster than that – oh how you can deceive yourself in this length of a race. Next, I approached the final aid station and the transition into the last flat 10 kilometers of the race. I had expected this to be hard, but I was surprised as to how challenging it ended up being. I won’t ever know, but I did wonder if I’d held off on the downhill portion would my body have felt less wrecked for this last section of the race – would I have survived it better and ended with a faster time? Or perhaps I’d pushed too hard on the uphills? Or it could just be that 50 km is a darn long distance, and it just takes a toll on the body, no matter what. Whatever the reason, the last 10 km were a real struggle and definitely the toughest part of the race for me. My quads were burning and my entire core was screaming at me to stop. I was shuffling along, and it took every ounce of energy I had to propel myself forward. However, despite my best efforts, I did take a few walking breaks. I stopped twice along the flat section and then resorted to a hike on the small uphills that were in the last few kilometers of the race. Unfortunately, because of my struggles I lost several placings during these last 10 kms and was passed by at least 5 women! At the time, I didn’t have the energy to care, but after finishing I thought - if only I’d pushed harder, maybe I could have held my placing better… if only, right? I appreciated the mile markers along this last stretch – it helped to think – ‘ok, just X kms more’ or only ‘x hundred meters’ until the next mile marker. Because of these markers, I had a pretty good idea of how much longer I had until the finish. When I was about 600-800 meters to the finish, I crossed a road, and there was a marshal standing there, who yelled out encouragement to me and told me ‘way to go, only 6 minutes to the finish!’ What, I thought, that can’t be right, I know I’m going slow, but I don’t think it should take me that long to run that distance. Luckily, she was mistaken, and within about a minute or so, I saw the final marshal who directed me up a tiny slope to the finish line. I had done it – I had ran 50 kms (actually about 52, as the race was a bit long)! It felt so awesome to run up to the finish line – and complete this beast. 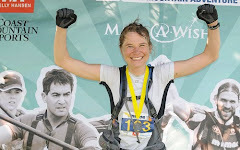 Shane met me at the finish line, and all I could say was “my legs are thrashed I have to lie down.” I staggered over to a grassy area, and plopped myself right down into a complete supine position. Aww, that felt sooo good! Adam Campbell – a fellow Canadian succeeded in winning the race in a time of 3:48:55. The two leaders, Max King and, took a wrong turn in the middle of the race (due to course marshals and flagging not yet being set up), allowing Adam to come up from behind to take the win. Huge congrats to him. Ellie Greenwood, also a Canadian, unsurprisingly was the first female in a time of 4:09:27 (wow, makes me look slow!) coming in over 13 minutes ahead of the second place woman, and beating her own course record from the previous year. Shane struggled a bit during the race, as his legs felt flat and he didn’t have the extra edge to race to his potential. Despite that he still finished a respectable 24th place overall in a time of 4:11:44. Overall it was a great race, a good challenging course, with frequent aid stations and encouraging marshals. The post race food was pretty good too – soup and bread, with some potato chips and fruit. Thanks to the race director Kristy Moel – Despite the challenges, I would definitely consider running another 50km race again. This race was re-scheduled from January, due to snowy conditions. At the time, I was elated, as I was feeling low and tired and quite happy to spend a day at home. The new date however was sandwiched between 2 other Island Race Series races, which would mean 3 races in a row for myself and many other racers. Despite coming off a strong race the week before, the long hours of racing and training got to me on the morning of Cobble, and I had a bit of a mental battle to get into race mode. However, when the horn went off, the race juices got flowing, and all systems were go. Since last year, I've been chasing a goal of breaking 40 minutes on a 10 km race. I was hoping to reach that goal this year, but based on my earlier race performances this year, I wasn't sure I was quite there. However, I was hoping to be close, so that it would line me up for a good TC 10km. Within the first kilometer, I felt that I was going to have a good race. My body felt good and my legs felt strong. Although I knew there was still a lot of race ahead of me - the early indications were good. I knew the course well, having raced it each year since 2008, and remembered where the up and down sections were and where I could push and where I needed to keep up the pace. The first kilometer was about getting into a good position, and establishing good rhythm. I noticed already that I was passing people and slowly inching my way forward. The second kilometer involved a turn-around and a slight uphill. It required a bit more grit and determination to not let the uphill slow you down too much, and I continued to move my way up the line. There were quite a few spectators around this portion of the course, and from the calls of encouragement, I knew that Julie Van Veelan was just behind me. Knowing she was right there was good motivation for me to keep moving, and not let up. Yuki Otsubo was again just ahead of me, and my goal was to try and stay with him for as long as possible. He'd paced me well at Hatley, and I was hoping I'd be able to keep up with him again today. As we turned the corner onto the main road, towards the 4 km marker, there was a bit of back and forth between a few racers, as we passed each other, one in front and then the other surging for a bit. Soon, we fell into a pretty static placing, with Yuki just ahead of me and Julie just behind me. As the kilometers clicked by, I continued to feel strong and knew that I was holding a good pace. While I always take my splits during a race, I prefer not to look at my watch, as it can stress me out to think I'm either potentially going too fast, or too slow. So, I run by feel, and thus far, it's fared me well. I'm usually done by the time I cross the finish line and rarely do I have a ton in reserve, nor do I often fall apart before the finish line (although I do often wish the finish line was closer or sooner! )- so I feel that my pacing is pretty decent. There are a few slight inclines and descents in this race, although nothing major -however the rolling nature of the course does cause splits to not be completely even. One thing I noticed in this race was that rather than letting up on the uphills, I was able to push up them and keep my momentum strong - which felt good. My favorite part of the race is when we make a turn onto a road that is lined with beautiful, large, looming evergreens. This section of the race definitely has its share of small hills, which feel all the more large as it's towards the end of the race - but the winding nature of the road and the surrounding trees make it seem peaceful. It was during this section, around the 8km mark, that I came upon Larry Nylen. I had been slowly making my way closer to him throughout the race, seeing him just ahead of me. I wasn't sure what the outcome of the race would be - but once I passed him, he didn't pick up the pace to stay with me, so it seemed like I might have more left in the tank than he did. Finally, I passed the last kilometer marker. At this point, I was running in a group of a few guys - a few just ahead and a couple just behind me. There was one younger guy who I was inching towards, but every time I would make my way up to him, he'd put on a bit of a surge to stay ahead. This resulted in a few hundred meters of cat and mouse, as I would surge and then he would surge, each of us putting on the extra gears to not get passed. However, after a bit, I realized that I may be taxing myself too much, and had to ease off, as otherwise it might result in the remaining 700 meters being disastrous. Now, it was simply push to the end time -- around a few corners and then finally the 100m sprint mat was in sight! I didn't have much for a sprint this time, but I'd heard cheers for Julie, so I knew she was close behind me. I was determined not to get passed on the line again, so I tried to push the pace as much as I could, as I heard Chris Callendar cheering me on. I was happy to cross the finish line and also to have been able to hold off Julie. As I finished the race I actually had no idea of my time, as the timing clock was blocked by another object. So, it wasn't until I looked at my own watch that I saw that I'd come in under 40 minutes!! Hurrah, I was so elated. I turned around and gave Julie a huge hug - we'd both done it! I saw Larry come in soon after me, and while I wasn't certain of his time, I hoped that he had also completed the race in under 40 minutes. I later learned that he'd just inched under by a few seconds! So happy for him! My official time: 39:45. This was definitely the best race of my life in terms of how I felt. I felt strong throughout the race - in body, mind, energy, legs -- everything was moving smoothly and together. If only all races could feel this good. My splits were: 3:54; 3:53; 4:05; 4:07; 4:09; 4:04; 3:51; 3:58; 3:54; 3:51. Congrats to Shane Ruljancich as well for coming in under 33 minutes for only the second time- and on a hard, rolling course. This running high helped me get through the ensuing long run. As Shane and I are training for the Boston Marathon in April, the best way to still get our long runs in with all the racing is to incorporate them into race day, and complete the remaining section after the run. So, after the race, we still had about 20-22 kilometers to do. The run thankfully felt pretty good - and the legs did not fall apart on me! We got some beautiful views of the ocean along our route, and got a good dump of snow falling on us as well. Luckily it didn't stick to the ground, so did not provide for slippery conditions. It was definitely good to get the 1hour 40 minutes done and the running for the day completed. Now it was time for some good eats, rest and relaxation! It's amazing how sometimes you go into a race feeling only so-so, and thinking it will be a disaster, and it turning out the complete opposite - while other times, you can think you'll have a decent race and end up with a so-so performance. I've found that until I actually start the race and get past the first kilometer, I can't tell for sure how I am going to do. 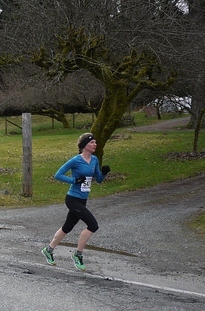 Case in point - this past Sunday was the 3rd Island Race Series race this year - Hatley Castle 8km out at Royal Roads. I hadn't raced this event since 2009, so was somewhat looking forward to this challenging course. Plus, I knew that unless I totally bombed, I would get a PB on this course. However, I say 'somewhat' because I haven't really been in race mode this year. I've been going through the motions of doing the races, without really putting my heart and body into the experience. My main difficulty for these races is just having enough sleep before hand. My body has high sleep needs, much higher than most people, and getting my required 9-10 hours of sleep every night is extremely challenging. As such, I am often tired, and feeling sleep deprived is my largest challenge in terms of my race performance. During the warm-up for Hatley, I could not stop yawning, and my body felt like it was dragging. 'Oh no' I thought 'it's going to be one of those races...' I line up on the start line, wait for the countdown and take off down the hill. 'Ugh' my body felt like it had no juice. A number of people pass me, whom I've beat in races before, but I couldn't get my legs to fire any faster. Then, as we turn the corner away from the ocean, I somehow find my gears. I slowly start inching my way forward and passing people. Hayden Earle is just ahead of me, and I follow him as we move forward through the pack of racers. Soon, I see Yuki Otsubo just in front of me. He's always beaten me by a good margin, so I try to stick near him, wondering how long I can hang on. I don't know where my energy is coming from, but I'm feeling good and it feels great to be able to push up the small inclines. Yuki and I continue to pass other racers, and I know that Julie Van Veelan is just behind me, as I hear onlookers cheering her on. At this point, early in the race I hope that I can stick to this pace and not loose my umph near the end. We round a corner, and head down a slight downhill towards the 3km marker. Up ahead, I see Larry Nylen, another strong Masters runner, who has been running strong this year and who also is faster than me. 'Wow,' I think 'I can't believe my placing.' I pick up a few more places as I push down the downhill slope. Next, we round a corner and are faced with the largest hill in all of the Island Series races. This one definitely takes some energy and is perhaps 300-400 meters long. I hear Bob Reid remind me to relax my shoulders as I start the climb. At this point, my body starts to hurt somewhat, and my pace slows. Several racers pass me, including Julie, as she bounds up the hill as though she was running on a flat road. Meanwhile, I'm trying to preserve to get to the top and not lose too much time to her. Just as I crest the top of the hill, I pass Larry. I urge him to come along and keep up - but he tells me to go on ahead. I start to pick it up a bit, to try and close the gap with Julie. Somewhere around kilometer 5, another turn-around point, I manage to pass Julie, unexpectedly. However, being a fierce competitor, I know that she'll stay close behind me. Yuki is still just ahead of me - I'm surprised I've been able to keep contact with him this long. Now, comes the fun part of the race, as we make our way into the trails of Royal Roads. This is a fun course as it incorporates a few different elements with some undulating territory, some road and some trail. The trail portion is fun, but also includes a few more undulations - both up and down. The last 2 kilometers of this race are pretty fast, as they include a pretty decent downhill and then the last kilometer is flat, flat, flat. As I pass the 7 km marker, a bystander calls out to me 'way to go, 2nd place'. 'Really' I can't believe it, is there really only one other woman in front of me? I didn't dare look back, but all I could think was that Julie was right there behind me. Ahh.. the last km can often feel so long, as you search for that finish line. First, I hear the cheering, and then next I see the 100 meter sprint mat up ahead. Then, I heard the footsteps. Here comes Julie and she passes me just as we cross the 100 meter mat. I don't always trust my sprint abilities, and almost let Julie just whip past me. Then, my better sense kicked in and I thought 'what am I doing, why am I just letting her pass me?' So, I kicked it up and stuck on her like a leech. I left it go a bit too long, and wasn't able to catch her, but we ended up less than 1 second apart. Despite the fact that I was beat at the line, I'm happy with my performance - definitely my best race of this year. It was great to feel so good throughout the race, and feel like I was really racing to my potential. It was also great to have good tough battle with Julie. My final time: 32:49; splits: 8:22 (km1-2); 3:52; 4:28; 4:16; 4:13; 3:50; 3:47. I did this race two years ago, and a few runner friends from Victoria were keen to go again. It's a wonderful, fun low-key 25 km race on fantastic trails in a beautiful, lush forest. The race itself is held in State Moran Park, as we climb up Mount Constitution twice, which rises up to 2,400 feet. 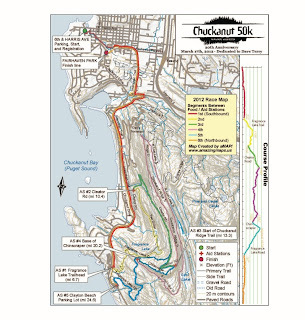 Over the course of the race we gain about 3,500 feet of elevation. The travel is somewhat of an inconvenience, as although it's quite close as the crow flies to Victoria, there are no direct ferry routes during the winter months. As a result, it ends up taking a full day of travel to get there and back. However, as an occasional race, it's worth it and a nice treat. The trails were awesome, and I started off at a pretty decent clip as we bounded up and around a few roots and rocks, and around corners as we made our way slightly uphill. Larry Nylen was just a few racers ahead of me, and I wondered how long we would stay close together. Unfortunately, only about 15 minutes into the race, a racer a couple of people ahead of Larry sprained his ankle quite badly. We came upon him groaning on the ground unable to mutter any words. As I ran up, Larry and another runner were already standing around and seemed to have the situation under hand... not seeing how I could add value, I carried on, hoping the runner would be okay. Larry, the good guy he is, ran back to the road, where he found some marshals to inform about the injured runner - in doing so he lost at least 15 minutes. The climb continued pretty gradually as we ascended the mountain. However, the real climb did not begin until about 30 minutes into the run. We crossed a road, and I looked up a steep slope right in front of me. As we began to ascend into the forested abyss, I thought - 'okay, here we go'. So far, I had been feeling good and hoped that I would continue that way as the real climb began. There was already snow along the sides of the trail, and it would only increase as we made our way up to the summit. The climb zig-zagged back and forth and the snow on the ground slowly increased in volume. Soon enough we were running on crunchy, hard snow that thankfully was not very slippery, but definitely harder to run in than on a bare trail. As I made my way up the mountain, I found myself able to pick up some speed on the flat or slightly downhill sections - often passing other runners - some of which would pass me back on the steeper uphill sections. While the climb was pretty steady, there were a few small dips and flats, allowing small reprieves here and there. As we neared the top, we encountered a few steep sections, causing me to change into a power-hike, although only for a few minutes at a time. I felt that overall my climbing was better than two years ago, but my speed was impacted by the snowy cover on the ground. Due to the snow, the trail was hard to see at certain spots, causing me to question which way to go. While the route was flagged along the way, a bit more would have been helpful, especially with the snow. At one point, the trail crossed back on itself, crossing a river - and I took a few moments to figure out which direction to go into. Two runners came up behind me, and we stared around before figuring out that the trail was actually behind us! Towards the top of the mountain, we began running along a cliff, which provided outstanding vistas of the sea and the peninsula. I slowed down slightly to take in the view, taking quick glances over my shoulder, while also watching my feet, as I tiptoed along the snow and ice. Then, it was time to keep motoring, as I could smell the top of the first major climb. I felt like the climb was going on forever, and I was itching to summit. As I made my way up the mountain, I could feel the temperature drop, and the winds increase. My arms were completely frozen and numb, although my core was warm. Even just taking a gel out of my water bottle pocket was a challenge. Finally, I heard the cheering and knew I was just about there - 1hour 10 minutes in. There was a steep rise to the summit, as a bunch of eager volunteers, bundled up in many layers, cheered us on. An aid station was located at the top of this climb, and the volunteers were kind enough to ask me if I needed anything, as I was huffing my way towards the top. I shook my head and was warned about the slippery downhill section that ensued. After a short road section, we turned back onto single-track and much more comfortable, less slippery downhill. However, due to the snow, it definitely caused me to check my speed somewhat on the downs, especially anything steep. Two years ago, I'd reveled in the downhill - making up a lot of time as I blasted my way down. This time, the snow was a definite factor - slowing me down. But, I was still able to move at a decent clip - or at least I thought I was, until a male runner came up behind me, just hammering it. I was able to hang onto him, and stayed not too far behind, as we finished the first downhill section, and started climb #2. I was able to pass him at this point - and was able to stay in front until the end. By the bottom of the downhill section, we'd made our way out of the snow for awhile, but we soon headed back into it. This second climb was rough for me. It seemed to go on for awhile, and I just kept wondering how much further. I'd look up at the tree line thinking 'Wow, the top still looks so far away!' The second climb was much shorter, taking only about 30 minutes, but on the tired legs and body, it was tough. Although I'd had one gel and one fruit bar, I still felt somewhat energy depleted and was so happy to make it to the top. Then came the final descent! Yay! At this point, there was about 9 km to the end. This was a fantastic downhill - fast and flowy - especially once we got out of the snow. Then I could really fly. I was completely expecting Mr. Fast on the downhill to come up behind me, but somehow I was able to hold him off this time. One little road crossing and a final 2 km to the finish around the lake. I had previously thought that this final section was 5km to the end, but as I crossed the road, a volunteer mentioned to me that I had '1 mile to go'. I figure it was closer to 3 km, as I saw a sign a ways in that said '1 mile to Camp Moran' and it took me about 16 minutes to get from the road to the finish at Camp Moran. I had enough juice in my legs to push somewhat hard on the downhill and flat sections, but there were a few small climbs that the legs did not like. I did run the whole last section, but due to sheer determination. At this point I didn't want someone to come up behind me and smoke me at the finish. As you make your way towards the end of the race, you catch glimpses of the beach, and I could see myself slowly inching my way forward. Then, came the best sounds I'd heard all day -- 'cheering'. I knew the finish line was close now. One final descent onto the road, and then one more small push uphill to the finish. It was only at this point, ~400 meters to the finish that I got confirmation that I was in fact the first woman. The last climb was tough, but was I ever ecstatic to cross the finish line, with the knowledge that I'd actually come in first female overall. While everyone ended the day with smiles, the race itself was not without mishaps: After climbing like a rocket up the mountain, in second place, Andrew pulled his groin muscle, forcing him to slow his pace. He managed to still finish in the top 10, but was slower than he otherwise would have been. Larry stopped to help an injured runner, losing at least 15 minutes, as he ran back to near the start to notify the marshals. Valerie and Sara both had pretty good races, and made their way through the snow and ice quite well. Kathleen unfortunately decided to pull out of the race, due to extreme fatigue, but was all smiles to greet us at the finish. Overall it was a great weekend getaway with friends! Race-day came and it was a day that I was not in race-mode. I was feeling nervous about the race, my quality of sleep and my ability to perform given how terrible I'd felt just the previous week at the Thetis Lake Relay. Although the race did not begin until 1pm, I was helping out with registration, so I made my way to the race-site by 11am. It's fun to see the racers come in and put some faces to names that I've seen on race results many times over. It's also interesting to see the 'other side' and see a glimpse of what's involved on race-day. I stayed until about 12:30, when I headed out to get changed, make a pit stop and get in a quick warm-up. The time flew by - not sure where it went - and before I knew it I had time to only do a quick 5 minute warm-up before it was time to make it to the start-line. Then, with only a few minutes to go, I was scrambling to find my race bib... luckily, it all came together, and I made it to the start, with 1-2 minutes to spare. The weather was practically perfect. Cool, but not cold and no rain. The conditions were perfect for a good race, now it was time to see if I was ready for a good race. The race started out fast - as the racers jumped off the line with gusto. I always tend to fall behind a bit on the first few road hills, as I don't have as much push in me at that point as many others, who push past me. Within a few minutes we funneled onto the trail, and the real race was on. I quickly found myself in the company of a few other women- and I wondered how we would fare - who would come out ahead. Cara Obee (Williams) was just ahead of me, and my goal was to stick with her for as long as possible. As we bounded along the trail - I knew this was going to be a hard race. It's essentially a suffer-fest the entire way, as there's no breaks, and not the same rhythm as a road race. It was going to be: push as hard as you can until the finish line. It's also a test to see how you can handle some challenging situations - there's two ice-cold puddles in the race, and some gnarly technical terrain that's been added in for good measure. This race attracts a few different types of runners – the trail runners, who only run on trails, the road runners, who with a few exceptions mostly run on road, the cross-country runners, who like the muck and sloppy conditions and then those runners who like to do it all. Because it is not as hilly as most trail races, this race picks up a few roadies who bring speed to the flat open sections. Thus, you never know exactly who your competition will be, or how they will fare over the varying conditions. At around the 4 km mark, we hit the first puddle. This puddle has gotten more and more shallow over the years, as CRD Parks have actually filled in the ground beneath. It's a bit disappointing, as the extreme conditions give this race some of its character -so now rather than being knee deep, the puddle is only just over ankle deep. By this point in the race, I had been able to get ahead of some of the women that had been around me near the beginning -but Cara had also pulled away from me somewhat. I had noticed a few other women move past me early in the race as well, who I didn't recognize. Now it was a race to stay ahead and hope that no other women pass me -and see if there were any more spots to pick up. Puddle #2 was not far after Puddle #1 - and it was definitely larger and deeper. There was also a log to hurdle over towards the end of the lake. I always try to move as fast as possible through the puddles, as they definitely freeze the feet, and it takes a few minutes for the numbing to wear off, and for your feet to feel normal again. However, this can also be a downfall, as I heard someone fall into the water after me, and I found out afterwards that it was Karen Laberee, an excellent masters runner. That would be quite a shock to the system, and I can imagine make it hard to get back into the race rhythm thereafter. Immediately following this puddle, is a fairly steep downhill over some loose rocky terrain. While it's not super technical, the numb feet always make this little hill a challenge for me, and cause me to slow down more than I otherwise would. Luckily, it's a pretty short section - and after that it's back into push mode. Then, we got into a bit of more twisty trail, and some new single-track, that the race Director, Bob Reid, had added into the race to make things more interesting. Plus, with the single-track came some new hills as well, of course. While the hills were not super long, they were steep, and with their placement in the race, they were definitely a challenge. I grunted up then, as I heard the volunteers and fellow Prairie Inn Harriers yell encouragement to me. Wow, this race is hard, is all I could think, as I acknowledged them with a small head nod. Now, the race was nearing the home stretch, as I made my way back along the Sue Reid trail, and the final somewhat technical aspect of the race. Once I turned off that trail, I knew I had no more than 10 minutes until the finish, and only a few little hills to beat up along the way. I'd had a bit of back and forth with a women, who I later learned was Katie Surguine from Nanaimo. She passed me along some of the broad, open trail sections heading towards Lower Thetis, and kept pushing the pace. I tried to stick with her, but the final three hills (Little Gunner, Big Gunner and Big Bugger) beat me up a little. My body was definitely worn down by this point, and I didn't have as much energy or gusto on the hills as I would have liked. I felt relatively good pushing the pace on the flats, but the hills were a different story. I trudged my way up the hills, enjoyed the downhills and tried to not let Katie get too far ahead. Finally, the finish line was in sight - and there were only a few strides in the lake keeping me from the end. Ahh -- how good it felt for it to be all over. It wasn't the best race ever for me, but I had felt pretty decent, and definitely much better than at the Thetis Relay a week earlier. I was tired, but not exhausted, and felt I'd put in a decent effort. I ended up finishing as 8th women, 5th in my category (30-39), and 56th overall out of 297 - oh yes, and 14 seconds behind Katie. Congrats to Shane Ruljancich, who pulled out another strong performance, winning the race and edging out some stiff competition from Jasper Blake. I'm writing this a bit out of order, as prior to this race I competed in the Shawnigan Kinsol half-marathon at the end of October. But, as that will take longer to write up, I thought I'd start with a quick entry about the Thetis Relay. As always, the Thetis Relay hosted by the Prairie Inn Harriers is a fun and popular event. This year I joined a team with Cara Obee and her Pura Vida Fitness Bootcamp. For the first time ever, I was going to run the first leg. I'd always shied away from the first leg, as I wanted to avoid the masses. But, this year I decided to try something different. Luckily, the weather cooperated with us. Earlier that morning, it was pouring rain and I was worried that it would be soggy uncomfortable run. However, the weather gods prevailed, and the skies cleared in time for our 1pm start. I joined the start line with the other eager racers - quite uncertain of how the 5 km loop would go. I had felt pretty tired during my warm-up and feared that this would not be my best performance. But, at least it was just a fun run, and the time was really only important for myself. Bob Reid did the countdown and we were off. Due to the mass start, the first leg is slightly different than the subsequent legs, as it starts up the road before merging onto the trail a few hundred meters later. Ugh - that first climb did not feel good - the legs felt heavy and the body felt tired. It probably did not help that I'd done a hill workout the evening before up the Observatory Hill. It wasn't all-out intervals, but still sufficient to feel it the next day. I felt it hard to get into a groove with so many people around. I wanted to go faster, but it was hard to pass due to the narrow trail, plus although I knew I was capable of more, my body wouldn't give it to me. Okay - I resigned myself to just survive this run, and push as hard as my body would allow. I ended up running just behind this younger female (likely in her early twenties or late teens) who was definitely competitive and not wanting others to pass her. I paced right behind her for the first 2/3 of the race, and then passed her on a flatter section. I held onto this lead until the last hilly section. This course is known for its brutal finish, as in the last section of the course, there are 3 steep bugger hills to go up - and while they are not super long, it's just enough to push you over the edge at the end of a hard race. As a result of the tiredness in body and legs, this young woman blew by me and put on some significant distance. For me it was now just a struggle to get over these hills and push to the finish. Luckily once the final hill is done, it is followed by a lovely downhill where you can let your body go. Unfortunately, just before the finish line is the last kicker hill -- this one on the road. It's much shorter than the other 3 hills, but still an energy grabber - and it took all I had left to make it up and over this hill to finally pass off to my next teammate. Ugh -- I certainly was happy when that was over. However, given how I felt, it wasn't a horrible performance. I finished in 21:13 - still somewhat faster than last year (although on a slightly different course). Plus to top it off, our team actually came in 3rd place in the open women category! Afterwards, I did a very leisurely 45 extra minutes of running to get in some extra distance for the day. Still a fun day despite not feeling as well as I would have liked. My key passions in life are nutrition, health and fitness. I run and cycle regularly and compete in 15-20 running races each year; both on road and trails. However, technical trails are where I find the most joy. Over the next year I will be training for a 50 km race and working on how to ensure my nutrition feeds my training.